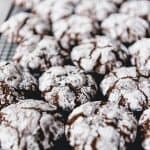 Double Chocolate Crinkle Cookies are a Christmas classic with soft and fudgy centers and a sweet crackled exterior. Make these for your Christmas cookie platters this year! Preheat oven to 350 degrees F. Line a baking sheet with parchment paper or a silicon baking mat. Mix the flour, cocoa powder, baking powder, and salt together in a medium mixing bowl and set aside. In the bowl of a stand mixer fitted with a paddle attachment, beat both sugars and the eggs for 3 minutes on medium speed until thick and light. Reduce the speed to low and add the vanilla and melted butter while mixing. Gradually add the flour mixture to the sugar and eggs while mixing on low speed, scraping the bottom and sides of the bowl to make sure everything gets mixed together. Add the chocolate chips. Place the powdered sugar in a small bowl and dust your hands with a little of the powdered sugar. Scoop heaping tablespoons of dough and roll them into 1-inch balls, then roll them in the powdered sugar to generously coat each cookie. Place the balls of sugar covered dough on the parchment or silicon mat lined baking sheet about 2-inches apart. Bake for 11-13 minutes until cracks appear in the top of each cookie but they are still slightly underbaked in the centers. Cool for 2 minutes on the cookie sheet before transferring to a wire rack to cool completely. Store cooled cookies in an airtight container. Chilling the dough might make rolling it into balls slightly less likely to stick to your hands, but I always skip this step. I actually don't think it makes any difference in flavor or texture and is mostly just to make the dough slightly easier to work with since it is so soft and sticky. You could always chill the dough in the freezer for 45 minutes or in the fridge for 2 hours before rolling into balls to make it a little easier to work with, but I find that dusting my hands with a little powdered sugar works just fine and I don't have to wait a couple extra hours for cookies!